As The Diplomat noted yesterday, an advisory panel appointed by Prime Minister Shinzo Abe was due to provide a report on the expanded parameters the government would like to set around the concept of collective self-defense. That report has now been delivered and some significant sound bites are making their way into the foreign press. There hasn’t been much information so far that wasn’t already expected or leaked to the public. However, most of those interviewed with ties to the government were determined to show how the new laws could help Japan be a more reliable ally to the U.S.
Former Japanese military commanders have pointed out that currently, Japan cannot even intercept ballistic missiles intended for U.S. assets. In an interview with the Japan Times, retired Vice Admiral Yoji Koda said, “The U.S. may expect us to shoot down a missile (flying toward an American territory), but we actually won’t. Such a situation could actually happen.” Some Japanese officials claim allowing collective self-defense will simply normalize an alliance in which the U.S. is obliged to protect Japan should it be attacked. The panel’s endorsement of this issue can be expected to be hotly debated when it finally reaches the Japanese Diet. Opposition lawmakers are highly vocal in their disagreement. Katsumasa Suzuku of the new Tomorrow Party of Japan (or Japan Future Party) has said, “Lifting the limits on the right for self-defense will bring us right back to the concept before the last war that led us to destruction.” Unfortunately for the Japanese opposition, the LDP holds a majority in both houses. The Abe government theoretically has the political capacity to take its new measures through the Diet. It will continue to be careful though, as any missteps could result in severe damage to its public popularity and nearly absolute rule. 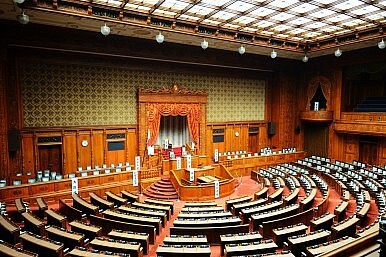 Next week begins the ruling coalition government discussions between the LDP and New Komeito over this issue. New Komeito is one of the few domestic forces left that has any degree of leverage with the LDP, and it is historically opposed to the notion of increasing the scope of Japanese military engagement. Japan, its allies, and the larger region will wait to see how much influence New Komeito really has in the government.